In my fiction writing I typically invest almost as many hours choosing the names of people and places as I do writing about them. These details matter; I’ve always felt that in fiction, names should carry layers of resonance that reflect, reinforce, contradict, or otherwise illuminate aspects of the person or place. This only added to the layers of tingly mirror-universe déjà vu, then, when I recently found myself in a real-life place that shares part of my own name. Before zooming in fully on that moment, though, let’s back the lens off for some important context. In 1962, U.S. 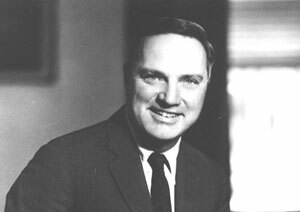 Congressman Clement “Clem” Miller spearheaded the bill creating one of the nation’s first national seashores—Point Reyes National Seashore, on the western edge of the area where I grew up: Marin County, just north of San Francisco, the southern anchor of his coastal Congressional district. 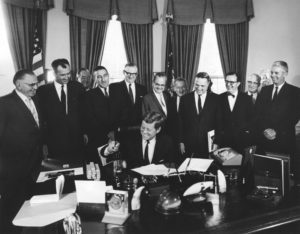 The bill creating Point Reyes National Seashore was signed into law by President John F. Kennedy on September 13, 1962 (see photo—Clem Miller is the tall, younger man at center-right, just over JFK’s left shoulder). Achieving national park status for this remarkably scenic stretch of coastline required Miller to knit together a coalition of federal officials, local leaders and regional landowners—a coalition which included the Marin County Planning Commission. My father, an architect, was a member of the Planning Commission, and that fall he and my mother were actively involved in Congressman Miller’s re-election campaign. On October 7, 1962, in the midst of the campaign, the small plane carrying Miller from one event to another crashed, killing all on board. A few days later, Clem Miller was buried at Point Reyes National Seashore in a funeral attended by family, friends, and supporters including Secretary of the Interior Stewart Udall, and my parents. At the time, my mother was eight months pregnant with me. Sitting amongst the mourners, watching Miller’s heartbroken family, Mom and Dad were reminded that he left behind four daughters and no sons. They decided in that moment that, if I was a boy, my middle name would be Clement. 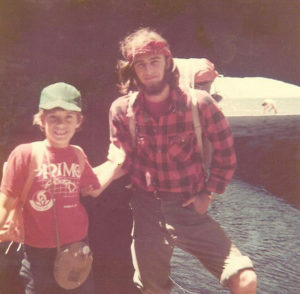 Growing up in Marin I visited Point Reyes many times, usually when tagging along with my older brother Gerry, as seen in this photo of us at Arch Rock in about 1972. The origins of my middle name would come up in conversation from time to time, but to my childhood self this thread of connection always felt abstract and far away. That was still mostly true when I majored in political science at UC Davis—though it grew stronger when I finished graduate school and went to work for a congressman from coastal California (Southern this time), in whose office I came across Clem Miller’s name and profile when looking at historical records of the California Congressional delegation. In the end I spent a decade working in the public policy arena before moving into the non-profit world. 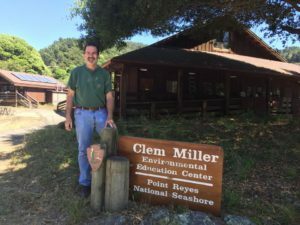 Finally, earlier this month, 55 years after Clem Miller died, I visited the nature center at Point Reyes that is named for him, just after several dozen grade school kids had departed after a week of outdoor education summer camp. There, in a wildly beautiful setting that only still exists because of Miller’s determined efforts to preserve it for all, I touched the sign bearing his name—our name—and again felt a deep connection to a person I will never meet. In a postscript that smacks of karma, while subsequently researching a couple of dates mentioned in this post, I made a further discovery—it turns out that Clem Miller’s grandson is a writer and musician named George Watsky, who also happens, like me, to be half-Jewish on his father’s side. Go figure.